Mr. Hosokawa is being thrown a birthday party by government officials and other muckity-mucks in South America. The true purpose of the party for the government is to persuade Hosokawa into building a factory in their poor nation. Mr. Hosokawa, on the other hand, has absolutely no interest in doing business there – he has accepted the invitation in order to see a private performance by his favorite opera singer, Roxane Coss. The party is in full swing when 18 freedom fighters come barreling into the mansion and take everyone hostage. 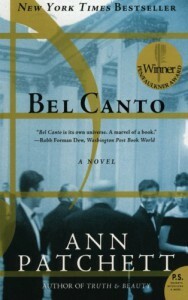 Bel Canto is the story of their time in captivity. 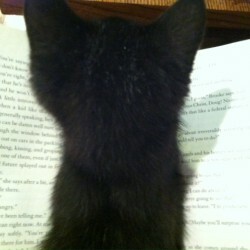 What a strange little novel. I was hoping I’d form a definitive opinion by the time I finished, but I’m still stuck shaking my head. I did enjoy the numerous amounts of characters in this book. Patchett has done a remarkable job creating a memorable ensemble cast. However, Love in the Time of Stockholm Syndrome??? Weird.